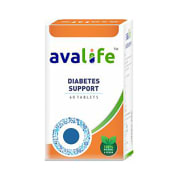 Avalife Diabetes Support Tablets helps in maintaining healthy blood glucose level. Diabetes is a chronic disease characterized by high levels of sugar in the blood. Modern sedentary lifestyle, smoking, irregular and unhealthy diet, etc. can lead to weight gain and increase in blood glucose levels. Based on 100% natural and vegan ingredients, it is safe to use. Take 1-2 tablets twice a day with water before meal or as advised by the physician. A licensed pharmacy from your nearest location will deliver Avalife Diabetes Support Tablet. Once the pharmacy accepts your order, the details of the pharmacy will be shared with you. Acceptance of your order is based on the validity of your prescription and the availability of this medicine.